Please note that the content of this book primarily consists of articles available from Wikipedia or other free sources online. 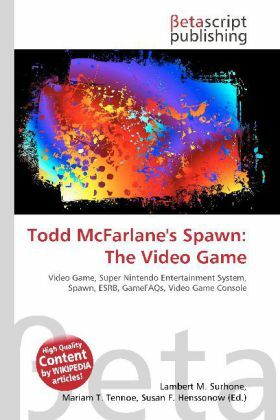 Todd McFarlane''s Spawn: The Video Game (often referred to simply as "Spawn") is a video game for the Super Nintendo Entertainment System, based on the comic series of the same name. It was produced by Acclaim Entertainment, and released in October, 1995. It was developed by the Ukiyotei corporation, and rated K-A by the ESRB rating system at the time. The game is a typical side scrolling combat game. It follows very closely the story arc laid out in the original comics. The game had a lukewarm reception by critics, Electronic Gaming Monthly giving it a 6.12/10 and Nintendo Power producing a slightly better 3.33/5. Public reception and current opinion has been a bit more favorable, with an average gamespot rating of 7.1/10.